Could a mutation in the hair keratin KRT83 cause recessive progressive symmetric erythrokeratoderma? In their recently published article, Shah et al. claim that a homozygous loss-of-function mutation in KRT83 leads to recessive progressive symmetric erythrokeratoderma.1 However, since KRT83 encodes a hair-specific keratin, we believe it is highly unlikely that a mutation in this gene would cause a strictly epidermal phenotype. In their discussion, the authors state that keratin K83 is also expressed outside of the hair follicle. They claim that Kb23, which is the rat ortholog for K83, is expressed in the whole skin, but the reference that they cite has only demonstrated expression in the hair follicle, and not the epidermis.11 The same is true for the claimed expression in the sheep wool follicles, where the reference cited shows expression only in the wool follicle, and not the epidermis.12 Shah et al. also claim that according to the human protein atlas, K83 is expressed in the skin, but actually, it was found only in the hair and not in the epidermis (http://www.proteinatlas.org/ENSG00000170523-KRT83/tissue). Staining as shown in the atlas is highly restricted, even though the antibody used in the human protein atlas is likely to recognize additional hair keratins. The expression atlas that is also cited in the article gives information on expression patterns of genes (http://www.ebi.ac.uk/gxa/home), and is not based on immunohistochemistry as stated by the authors. Since the skin samples used for expression profiling in this database are of whole skin and not the epidermis alone, they are likely to also include parts of hair follicles. Obviously, expression of KRT83 could be observed in these samples. In contrast, a large number of studies demonstrate robust, specific and reproducible expression of K83 in the hair.5,13-15 Thus, we feel that it is safe to conclude that K83 is hair-specific and is not expressed in human epidermis. We consider it unlikely that mutations in a keratin that is exclusively expressed in the hair would cause a severe epidermal phenotype that also involves the palms and soles, areas that are devoid of hair follicles. If they did, there would be profound implications for our understanding of keratins, and of skin biology in general. We believe that such a provocative claim should have been accompanied by proper demonstration that K83 is indeed expressed in the epidermis, and functional evidence that its loss can lead to an epidermal-specific phenotype. 1 Shah K, Ansar M, Mughal ZU et al. Recessive progressive symmetric erythrokeratoderma results from a homozygous loss-of-function mutation of KRT83 and is allelic with dominant monilethrix. J Med Genet 2016, Dec 13, Epub ahead of print. 2 Ramot Y, Zlotogorski A. Keratins: the hair shaft's backbone revealed. Exp Dermatol 2015; 24: 416-7. 3 Ramot Y, Paus R. Harnessing neuroendocrine controls of keratin expression: a new therapeutic strategy for skin diseases? Bioessays 2014; 36: 672-86. 4 Ramot Y, Paus R, Tiede S et al. Endocrine controls of keratin expression. Bioessays 2009; 31: 389-99. 5 Moll R, Divo M, Langbein L. The human keratins: biology and pathology. Histochem Cell Biol 2008; 129: 705-33. 6 Ramot Y, Zlotogorski A. Molecular genetics of alopecias. Curr Probl Dermatol 2015; 47: 87-96. 7 van Steensel M, Vreeburg M, Urbina MT et al. Novel KRT83 and KRT86 mutations associated with monilethrix. Exp Dermatol 2015; 24: 222-4. 8 van Steensel MA, Steijlen PM, Bladergroen RS et al. A missense mutation in the type II hair keratin hHb3 is associated with monilethrix. J Med Genet 2005; 42: e19. 9 van Steensel MA, Oranje AP, van der Schroeff JG et al. The missense mutation G12D in connexin30.3 can cause both erythrokeratodermia variabilis of Mendes da Costa and progressive symmetric erythrokeratodermia of Gottron. Am J Med Genet A 2009; 149A: 657-61. 10 Ishida-Yamamoto A, McGrath JA, Lam H et al. The molecular pathology of progressive symmetric erythrokeratoderma: a frameshift mutation in the loricrin gene and perturbations in the cornified cell envelope. Am J Hum Genet 1997; 61: 581-9. 11 Nanashima N, Akita M, Yamada T et al. The hairless phenotype of the Hirosaki hairless rat is due to the deletion of an 80-kb genomic DNA containing five basic keratin genes. J Biol Chem 2008; 283: 16868-75. 12 Yu Z, Wildermoth JE, Wallace OA et al. Annotation of sheep keratin intermediate filament genes and their patterns of expression. Exp Dermatol 2011; 20: 582-8. 13 Langbein L, Yoshida H, Praetzel-Wunder S et al. The keratins of the human beard hair medulla: the riddle in the middle. J Invest Dermatol 2010; 130: 55-73. 14 Langbein L, Schweizer J. Keratins of the human hair follicle. Int Rev Cytol 2005; 243: 1-78. 15 Langbein L, Rogers MA, Winter H et al. The catalog of human hair keratins. II. Expression of the six type II members in the hair follicle and the combined catalog of human type I and II keratins. J Biol Chem 2001; 276: 35123-32. We only became aware of the paper by Reinstein et al. after our manuscript was published online. It is gratifying to know that we are not the only group who has identified left ventricular non-compaction (LVNC) in males with loss-of-function mutations in NONO. Eur J Hum Genet. 2016 Jun 22. doi: 10.1038/ejhg.2016.72. Intellectual disability and non-compaction cardiomyopathy with a de novo NONO mutation identified by exome sequencing. Enabled by recent advances in sequencing technologies, genotypes from thousands of individuals are now available in online databases. While most of them aim to be the reference source of genotypes from healthy individuals, however, due to the lack of accompanying clinical data, geneticists now face the challenge of separating pathogenic mutations and rare polymorphisms. The frequency of pathogenic variants within a population database could be inflated by subjects who are not yet diagnosed or misdiagnosed. In particular, it is more challenging for geneticists working on late on-set neurodegenerative diseases, such as SCA40 (1), where pathogenic variants may lurk within the genome for decades, until gradual deterioration of symptoms could be observed. In the case of SCA34, only 63% of ELOVL4 L168F carriers demonstrated ataxia (2). This is possibly due to the relatively young age of carriers (less than 48 years old), and thus the ataxia symptoms take time to develop (2). The ExAC database (3) is one of the largest genotype databases to date, which combines sequencing data from 60,706 unrelated individuals in cohorts such as National Institute of Mental Health Controls, schizophrenia, bipolar disorder, Tourette's syndrome, and The Cancer Genome Atlas (TCGA). This clearly shows that pathogenic variants can be found in ExAC, and thus it might not be suitable to be treated as the genetic background of healthy population. MacArthur et. al. (3) have clearly stated that ExAC was designed to be the reference data set for childhood-onset Mendelian diseases, and the subjects are free of known severe pediatric diseases only. Therefore, it is questionable to claim a variant as rare polymorphism based on ExAC alone. To illustrate the prevalence of neurodegenerative diseases markers in population genetics databases, we have screened all known markers of autosomal dominant Spinocerebellar Ataxia (SCA) and Spastic Paraplegia (SPG) other than SCA40 (Table 1). Altogether, 12 SCA markers and 6 SPG markers were found in the analysis with allele frequency ranging from 8.236e-06 to 0.0262. This reaffirms the notion that subjects with neurodegenerative diseases may exist in population genetics databases. It is known that the pathogenicity of a disease marker can change in different ethnicity background (4, 5). Ethnic specific modifiers may alter the penetrance of these markers, accounting for higher frequency of these markers in certain populations (5, 6). Since SCA40 marker induces apoptosis through JNK pathway activation (1), the relative activity of JNK1/2/3 and c-Jun could modulate the levels of apoptosis (7-9), regulating the penetrance of SCA40 marker as a result. 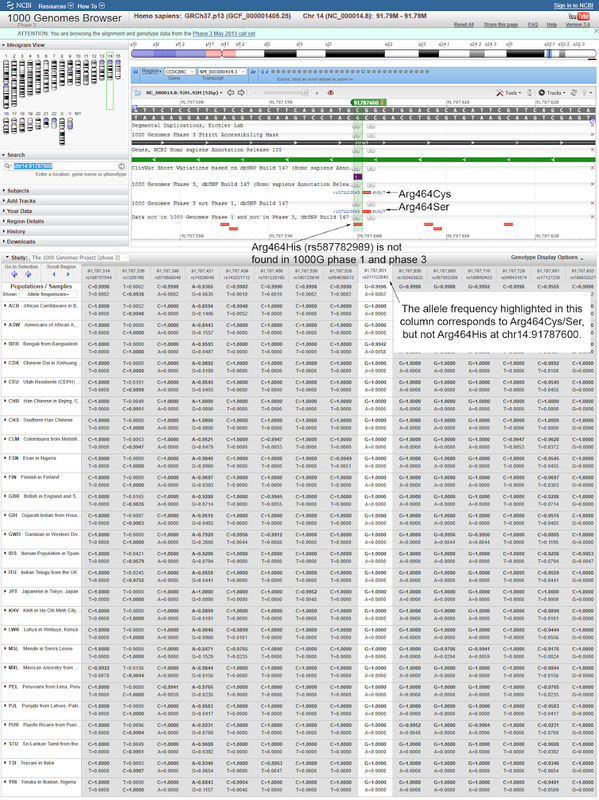 Besides, we believe the eLetter authors misinterpreted 1000 genome phase III frequency for CCDC88C R464H, since only R464C and R464S (rs371123543) could be found in the data according to NCBI 1000 Genome browser (Figure 1). To date, CCDC88C R464H is still unreported in 1000 Genomes phase III, 1KJPN (10), ESP6500, GoNL (11), SGVP (12), and UK10K ALSPAC/TWINSUK cohort (13). The absence of CCDC88C R464H in 1KJPN database, which curates the whole-genome sequences of 1,070 healthy Japanese individuals, clearly contradicts with the eLetter authors' claim that the variant is relatively common in Japanese control alleles. In our original study, we screened 199 local healthy subjects, but none of them harbours R464H. The eLetter authors also independently screened 24 local healthy subjects and 85 disease controls, yet the variant was only found in one patient with SOD1-associated autosomal dominant amyotrophic lateral sclerosis (ALS). Given the extremely low frequency of CCDC88C R464H variant in the population, it is unlikely that R464H represents a rare polymorphism. Of note, cerebellar ataxia was previously reported in an ALS case associated with SOD1 variants (14), so the cerebellar features of the patient containing both SOD1 and CCDC88C R464H variants merits further investigation. To explore the possibility of finding additional disease markers in our patient samples after the publication of our study in 2014, we now reanalyzed the sequencing data using the latest human genome reference (GRCh38), updated BWA alignment tool (version 0.7.15) (15), GATK haplotypecaller variant caller (Version 3.5) (16), Clinvar database (build 20160831), dbSNP 147, and 1000 genome database phase 3, yet no other known pathogenic marker was further identified. In addition to our in-house variant prioritization method as outlined in our original study, we did not observe any discrepancy after cross-checking our results against KGGSeq results (17). Together with the support of multipoint parametric genetic linkage analysis, gene expression profile mining and functional impact predictions as described in our study, we believe we have gathered substantial in silico evidence to support CCDC88C R464H as a disease marker. In addition to the in silico predictions that the CCDC88C R464H is a pathogenic mutation, here we provide additional functional evidence that the CCDC88C R464H activated the JNK-caspase pathway in the primary neuronal cells derived from the mammalian brain. We used the day-18 rat embryonic cortical neurons as our experimental cell model. Similar to the results we previously obtained from the human HEK293 cells, overexpression of the CCDC88C R464H induced the JNK hyperphosphorylation and caspase-3 cleavage in rat primary cortical neurons (Figure 2). This result therefore strengthened our hypothesis that CCDC88C R464H triggers apoptosis and contributes to the cerebellar atrophy in SCA40 patients. Table 1--Screening of autosomal dominant Spinocerebellar ataxia and Spastic paraplegia markers in population genetics databases. 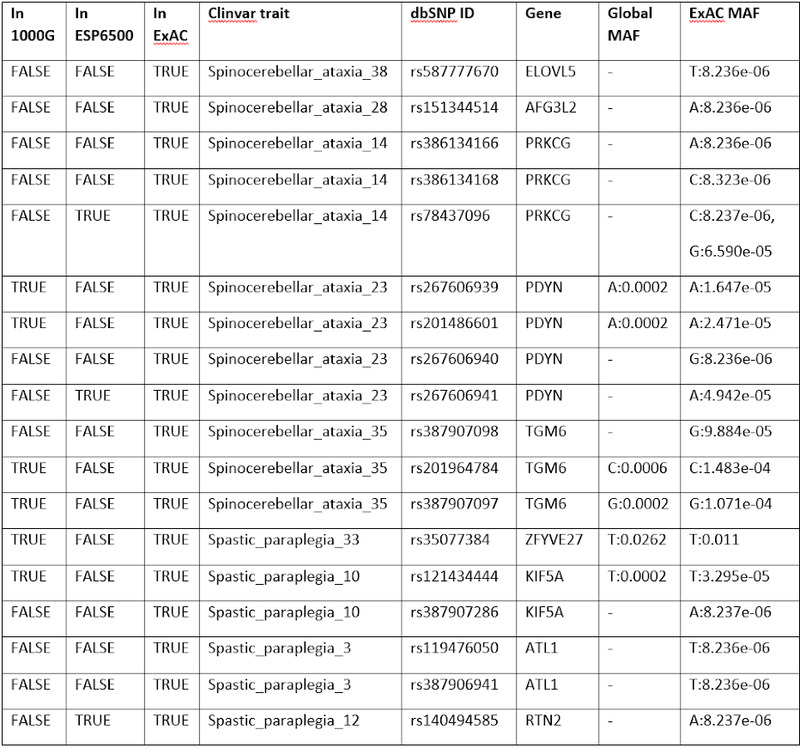 Figure 1--CCDC88C variants around Arg-464 position in 1000 Genome Phase III. 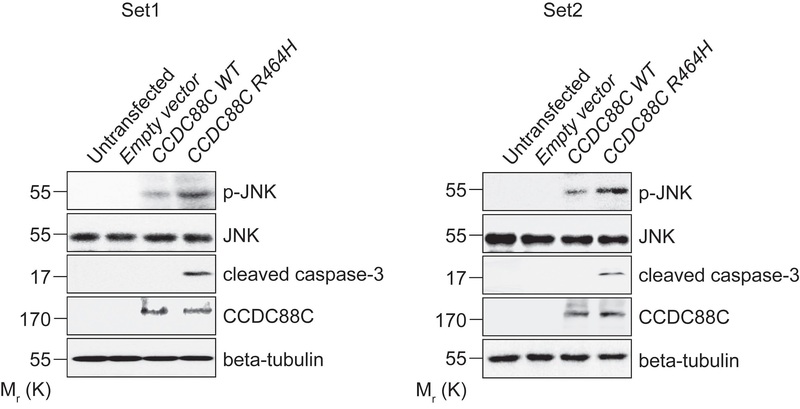 Figure 2--Overexpression of the CCDC88C R464H DNA construct induced JNK hyperphosphorylation and caspase-3 cleavage in rat primary cortical neuronal cells. Two independent trials (Set1 and Set2) were performed and the results are consistent. 1. Tsoi,H., Yu,A.C.S., Chen,Z.S., Ng,N.K.N., Chan,A.Y.Y., Yuen,L.Y.P., Abrigo,J.M., Tsang,S.Y., Tsui,S.K.W., Tong,T.M.F., et al. (2014) A novel missense mutation in CCDC88C activates the JNK pathway and causes a dominant form of spinocerebellar ataxia. J. Med. Genet., 51, 590-5. 2. Cadieux-Dion,M., Turcotte-Gauthier,M., Noreau,A., Martin,C., Meloche,C., Gravel,M., Drouin,C.A., Rouleau,G.A., Nguyen,D.K. and Cossette,P. (2014) Expanding the clinical phenotype associated with ELOVL4 mutation: study of a large French-Canadian family with autosomal dominant spinocerebellar ataxia and erythrokeratodermia. JAMA Neurol., 71, 470-5. 3. Lek,M., Karczewski,K.J., Minikel,E. V., Samocha,K.E., Banks,E., Fennell,T., O'Donnell-Luria,A.H., Ware,J.S., Hill,A.J., Cummings,B.B., et al. (2016) Analysis of protein-coding genetic variation in 60,706 humans. Nature, 536, 285-291. 4. Pollak,A., Skorka,A., Mueller-Malesi?ska,M., Kostrzewa,G., Kisiel,B., Waligora,J., Krajewski,P., O?dak,M., Korniszewski,L., Skarzy?ski,H., et al. (2007) M34T and V37I mutations in GJB2 associated hearing impairment: evidence for pathogenicity and reduced penetrance. Am. J. Med. Genet. A, 143A, 2534-43. 5. Mannan,A.U. (2008) Response to Martignoni et al. Am. J. Hum. Genet., 83, 128-130. 6. Smeets,C.J.L.M. and Verbeek,D.S. (2016) Reply: SCA23 and prodynorphin: is it time for gene retraction? Brain, 139, e43. 7. Ham,J., Babij,C., Whitfield,J., Pfarr,C.M., Lallemand,D., Yaniv,M. and Rubin,L.L. (1995) A c-Jun dominant negative mutant protects sympathetic neurons against programmed cell death. Neuron, 14, 927-39. 8. Yang,D.D., Kuan,C.Y., Whitmarsh,A.J., Rincon,M., Zheng,T.S., Davis,R.J., Rakic,P. and Flavell,R.A. (1997) Absence of excitotoxicity-induced apoptosis in the hippocampus of mice lacking the Jnk3 gene. Nature, 389, 865-70. 9. Kuan,C.Y., Yang,D.D., Samanta Roy,D.R., Davis,R.J., Rakic,P. and Flavell,R.A. (1999) The Jnk1 and Jnk2 protein kinases are required for regional specific apoptosis during early brain development. Neuron, 22, 667-76. 10. Nagasaki,M., Yasuda,J., Katsuoka,F., Nariai,N., Kojima,K., Kawai,Y., Yamaguchi-Kabata,Y., Yokozawa,J., Danjoh,I., Saito,S., et al. (2015) Rare variant discovery by deep whole-genome sequencing of 1,070 Japanese individuals. Nat. Commun., 6, 8018. 11. Francioli,L.C., Menelaou,A., Pulit,S.L., van Dijk,F., Palamara,P.F., Elbers,C.C., Neerincx,P.B.T., Ye,K., Guryev,V., Kloosterman,W.P., et al. (2014) Whole-genome sequence variation, population structure and demographic history of the Dutch population. Nat. Genet., 46, 818-825. 12. Teo,Y.-Y., Sim,X., Ong,R.T.H., Tan,A.K.S., Chen,J., Tantoso,E., Small,K.S., Ku,C.-S., Lee,E.J.D., Seielstad,M., et al. (2009) Singapore Genome Variation Project: a haplotype map of three Southeast Asian populations. Genome Res., 19, 2154-62. 13. Walter,K., Min,J.L., Huang,J., Crooks,L., Memari,Y., McCarthy,S., Perry,J.R.B., Xu,C., Futema,M., Lawson,D., et al. (2015) The UK10K project identifies rare variants in health and disease. Nature, 526, 82-90. 14. Yasser,S., Fecto,F., Siddique,T., Sheikh,K.A. and Athar,P. (2010) An unusual case of familial ALS and cerebellar ataxia. Amyotroph. Lateral Scler., 11, 568-70. 15. Li,H. and Durbin,R. (2009) Fast and accurate short read alignment with Burrows-Wheeler transform. Bioinformatics, 25, 1754-60. 16. McKenna,A., Hanna,M., Banks,E., Sivachenko,A., Cibulskis,K., Kernytsky,A., Garimella,K., Altshuler,D., Gabriel,S., Daly,M., et al. (2010) The Genome Analysis Toolkit: a MapReduce framework for analyzing next-generation DNA sequencing data. Genome Res., 20, 1297-303. 17. Li,M.-X., Gui,H.-S., Kwan,J.S.H., Bao,S.-Y. and Sham,P.C. (2012) A comprehensive framework for prioritizing variants in exome sequencing studies of Mendelian diseases. Nucleic Acids Res., 40, e53. The report that a novel missense mutation in CCDC88C activates the JNK pathway and causes a dominant form of spinocerebellar ataxia that appeared in your Journal (1) is of great interest. Although we identified the same heterozygous missense variation (c.1391G>A, p.R464H) as that reported (1) in a Japanese patient with autosomal dominant cerebellar ataxia (ADCA), we report here that this variation in the CCDC88C gene may not cause ADCA. The proband in our family is a 55-year-old female. She visited our hospital because of unsteadiness of gait at age 49. Neurological examination revealed mild limb and truncal cerebellar ataxia. Brain MRI revealed cerebellar atrophy. Molecular analysis of the patient excluded SCA1, SCA2, MJD, SCA6, SCA7, SCA8, SCA12, SCA17, SCA31, SCA36 and DRPLA. We have followed her as an outpatient and the symptoms have progressed mildly over the past six years. The father noted unsteadiness of gait at age 50. His cerebellar ataxia progressed and he died due to aspiration pneumonia at age 87. The mother at age 85 and two sisters at ages 57 and 53 showed no neurological deficits. Unfortunately, we could not get information on the father's grandparents. On whole exome sequencing, we identified a heterozygous variation (c.1391G>A , p.R464H) in the CCDC88C gene as the most likely candidate causative mutation because this location is highly conserved among species (1), and bioinformatic analyses including Mutation Taster, PROVEN, and SIFT predicted it to be disease-causing (1). Then we continued to examine whether or not this mutation cosegregates with the disease in our pedigree. Unexpectedly, both affected and unaffected individuals in our family exhibited the same heterozygous variation on Sanger sequencing. Moreover, there is a relatively high rate of this variation among Japanese control alleles, and ExAC revealed 21 A alleles in a total of 119,910 chromosomes. In addition, the minor allele counts in 1,000 genomes and HGVD were 0.05% and 0.3%, respectively. We checked whether or not c.1391G>A could be a common variant in the local population in 24 local healthy subjects and 85 disease controls. Although the variant was not found in the former, it was found in a 48-year-old patient with a SOD1 mutation with autosomal dominant amyotrophic lateral sclerosis in the latter. Thus, this heterozygous variation (c. 1391G>A, p.464H) in the CCDC88C gene may not cause ADCA. This study was approved by the institutional review board of Yamanashi University, and informed consent was obtained from all participating individuals. 1. Tsoi H, Yu AC, Chen ZS, Ng NK, Chan AY, Yuen LY, Abrigo JM, Tsang SY, Tsui SK, Tong TM, Lo IF, Lam ST, Mok VC, Wong LK, Ngo JC, Lau KF, Chan TF, Chan HY. A novel missense mutation in CCDC88C activates the JNK pathway and causes a dominant form of spinocerebellar ataxia. J Med Genet 2014; 51: 590-595. Response to e letter ID jmedgenet el; 2826 by Refaeli et al., dated June14, 2016 A considerable amount of literature on the role of podocalyxin-like (PODXL) protein in normal mammalian kidney functions and to a lesser extent in mouse brain development is available. We agree that these studies particularly, "Anuria, Omphalocele, and Perinatal Lethality in Mice Lacking the Cd34-Related Protein Podocalyxin" by Doyonnas et al (1) and "Podocalyxin is a Novel Polysialylated Neural Adhesion Protein with Multiple Roles in Neural Development and Synapse Formation" by Vitureira et al (2) using podxl -/- mouse embryos and newborns have unequivocally demonstrated the role of this gene in renal function and brain development respectively. Doyonnas et al., (1) in their paper do mention that i) anuria and renal failure is evidenced only postnatally as there is possible maternal clearance in the embryos; ii) there is no evidence of extensive proteinuria, which is characteristic of leaky podocyte filtration in human nephrotic syndromes; and iii) more importantly, that there were no developmental anomalies in the hematopoietic and vascular endothelial cells which also express high levels of podocalyxin. The last observation, authors hypothesized, may have been enabled through functional compensation by other sialomucins such as CD34. Data on the status of neural development in their newborn mice with identical genetic background, which would have proved the effect of podxl deficiency in these two vital processes is however missing in their paper. Overall, the results from these mouse studies suggest that i) podxl protein is almost ubiquitous in expression, multifunctional, may have varying interacting partners and that functional/genetic redundancy exists. In our opinion, these features of PODXL are exactly what the two mutation studies in this gene one on autosomal dominant familial focal and segmental glomerulosclerosis (FSGS) (3) and our study on autosomal recessive juvenile parkinsonism (4) reflect. This is not unexpected considering the different genetic backgrounds in different families. Notably, in the paper by Barua et al, (3) i) the incomplete penetrance of the private variant p.L442R (i.e., one individual carrying the mutation but asymptomatic even at 53 years of age); ii) varying age of onset ranging from early teenage to adulthood but developing end stage renal disease between 2nd to 6th decade of life; iii) varying disease severity across affected individuals in the family but certainly not post- natal/newborn mortality (unlike in mice); and iv) rarity of mutations in PODXL gene in 176 additional FSGS families; together with mutant PODXL protein characterization in vitro which showed that the index mutation results in dimerization but does not alter protein stability, extracellular domain glycosylation, cell surface expression, global subcellular localisation and interactions with its intracellular binding partner ezrin are all the features of PODXL gene that need to be kept in mind prior to assigning it an indispensable role in kidney function and survival in humans. It is indeed appropriate that Barua et al (3) conclude that rare variants with low statistical genetic evidence such as observed in their study do not contribute significantly to glomerular disease in humans. Based on these observations, it is not unlikely that the index family with ARJP with homozygous mutations predicted to result in loss of protein did not manifest any symptoms of FSGS or any other kidney dysfunction, based on the data of last clinical examination in 2009. As for the two other concerns of Refaeli et al on the index mutation being unlikely of germline origin and NGS errors, both can be disregarded as both the parents are heterozygous for the index mutation (data not shown), and all informative NGS data are validated by Sanger sequencing. Further, their concern that mutations identified in unrelated PD cohort are just common protein altering variants is also ruled out as these were not observed in either our population or reported in any publically available large databases and therefore, were functionally characterized in our study. As for the demonstration of absence of PODXL RNA or protein, we have not been able to do that due to non-availability of tissues. It may please be noted that in the absence of clinical indications, it is difficult to obtain ethical committee clearance for collection of target tissues. In summary, from careful interpretation of the findings in the above mentioned studies as well as abundant data in literature [for eg. See Liao and Zhang, PNAS, 2008 (5)], it is clear that there are notable differences between mice and humans in i) the developmental phenomena; ii) functional compensatory mechanisms/genetic redundancy; iii) gene-gene interactions; iv) tissue specific transcript expression etc. Though experimental evidence for most of these aspects with specific reference to PODXL is currently unavailable, such differences may be believed to be useful to explain pleiotropy in PODXL [for eg. similar to that documented in cystic fibrosis (6)], possible tolerance to null alleles enabling apparently normal kidney function as witnessed in the ARJP family in our study (4) and comparatively late age of onset of FSGS, incomplete penetrance of the gene mutation etc. (3) and several other associated features. Finally, we would like to thank Rafaeli et al for their interest in our work and giving us an opportunity to highlight some of the differences which may exist between humans and mice in general and for role of podocalyxin in particular. We firmly believe that findings from animal models of human diseases are powerful tools but are not always true representatives for understanding complete human health and disease biology. Additional data as and when available on PODXL associated human phenotypes would be most insightful for our enhanced understanding of the role of PODXL in humans. References: 1. Doyonnas R, Kershaw DB, Duhme C, et al. Anuria, omphalocele, and perinatal lethality in mice lacking the CD34-related protein podocalyxin. J Exp Med 2001;194(1):13-27. 2. Vitureira N, Andres R, Perez-Martinez E, et al. Podocalyxin is a novel polysialylated neural adhesion protein with multiple roles in neural development and synapse formation. PLoS One 2010;5(8):e12003.? 3. Barua M, Shieh E, Schlondorff J, et al. Exome sequencing and in vitro studies identified podocalyxin as a candidate gene for focal and segmental glomerulosclerosis. Kidney Int 2014;85(1):124-33. 4. Sudhaman S, Prasad K, Behari M, et al. Discovery of a frameshift mutation in podocalyxin-like (PODXL) gene, coding for a neural adhesion molecule, as causal for autosomal-recessive juvenile Parkinsonism. J Med Genet 2016; 53(7):450-6. 5. Liao B, Zhang J. Null mutations in human and mouse orthologs frequently result in different phenotypes. PNAS 2008;105(19):6987-92. 6. Sing C, Risser D, Howatt W, Erickson R. Phenotypic heterogeneity in cystic fibrosis. American Journal of Medical Genetics 1982;13:179-195. Sudhaman, et al. Discovery of a frameshift mutation in podocalyxin- like (PODXL) gene, coding for a neural adhesion molecule, as causal for autosomal-recessive juvenile Parkinsonism. J Med Genet. 0:1-7, 2016. In the February 2016 edition of the Journal of Medical Genetics, Sudhaman et al(1) report the identification of a PODXL variant (c.89_90insGTCGCCCC) as the causative mutation in an Indian family with autosomal recessive juvenile parkinsonism (ARJP). They further claim that the insertion mutation in exon 1 results in a frameshift and loss of podocalyxin protein expression in disease-afflicted family members (homozygous individuals). They subsequently identify three novel PODXL variants (heterozygous missense mutations) in unrelated individuals with Parkinson's disease (PD). As the authors note in their report, we previously demonstrated that Podxl-deficient neurons (derived from Podxl-/- mouse embryos) display defective neurite branching in vitro(2). Thus, we concur with Sudhaman et al that the loss of PODXL expression from neurons or other functionally disruptive mutations in PODXL may alter neurite growth and branching. However, we have also shown that germline loss of Podxl in mice leads to anuria and death less than 24 hours after birth(3). This lethal Podxl-null phenotype is the result of a failure to produce podocyte foot processes and filtration slits during kidney morphogenesis. In 2014, Barua et al(4) reported a missense mutation in an exon encoding the transmembrane domain of podocalyxin as a cause for autosomal dominant focal segmental glomerulosclerosis (FSGS). Affected individuals presented with renal symptoms in the second decade of life eventually progressing to end-stage renal disease requiring dialysis or renal transplant(4). Thus, these previous studies in human and mouse have underscored the indispensible role for PODXL in normal mammalian kidney function and survival. From that vantage point we find it difficult to reconcile the late age of onset and phenotype observed in the Sudhaman manuscript. The phenotype was restricted to Parkinsonian symptoms with an onset of 17, 16 and 13 years. The fact that these individuals displayed normal birth and adolescent milestones prior to disease onset, and specifically normal renal function at age of examination (22, 20 and 17 years, respectively), is incompatible with the known function for this protein in kidney and leaves us skeptical of the conclusion that the ARJP-afflicted individuals in the family documented in the Sudhaman manuscript are indeed germline and functionally null mutations in PODXL. We note that the DNA sequence reported in the Sudhaman et al manuscript maps to a known in-frame Pro-Ser expansion polymorphism (rs759639123) (or similar dbSNPs) following Ser31 (duplication of GTCGCC). As this sequence is particularly GC rich, it is prone to sequencing errors that could have been misinterpreted as a null mutation. Although the authors suggested the possibility of nonsense mediated decay, they did not provide any data suggesting complete absence of PODXL RNA or podocalyxin protein, further raising concern as to whether the variant generates a truly null allele. While this locus and polymorphism could well be linked to the observed ARJP phenotype we would argue that, based on the published literature and the known mouse Podxl null phenotypes, it is unlikely that these afflicted individuals are carrying two germline null alleles. We are also concerned with the authors' interpretation of the replication study, which involved screening for any PODXL variants in 280 PD patients. Due to the high frequency of rare protein-altering variants in the human genome, there is a distinct possibility that these missense PODXL variants are not directly associated with PD. The three reported PODXL rare variant carriers consist of one young-onset, one old-onset and one familial PD patient where the variant functionality and segregation studies were not described in the report. The presence of such variants, in the absence of confirmatory biochemical or phenotypic evidence, should not be interpreted as causal. Furthermore, two (p.294Q and p.S373N) of the three variants display poor evolutionary conservation and exhibit discordant amino acids between human and rodent proteins. Finally, because podocalyxin is highly expressed by vascular endothelia and kidney podocytes, immunohistologic evaluation of podocalyxin expression on vessel-containing skin biopsies (or better still, renal biopsies) from the ARJP-afflicted patients described in the manuscript would likely resolve this issue. In lieu of that data, we would argue that the main conclusions of this manuscript remain speculative. REFERENCES 1. Sudhaman S, Prasad K, Behari M, et al. Discovery of a frameshift mutation in podocalyxin-like (PODXL) gene, coding for a neural adhesion molecule, as causal for autosomal-recessive juvenile Parkinsonism. J Med Genet 2016. 2. Vitureira N, Andres R, Perez-Martinez E, et al. Podocalyxin is a novel polysialylated neural adhesion protein with multiple roles in neural development and synapse formation. PLoS One 2010;5(8):e12003. 3. Doyonnas R, Kershaw DB, Duhme C, et al. Anuria, omphalocele, and perinatal lethality in mice lacking the CD34-related protein podocalyxin. J Exp Med 2001;194(1):13-27. 4. Barua M, Shieh E, Schlondorff J, et al. Exome sequencing and in vitro studies identified podocalyxin as a candidate gene for focal and segmental glomerulosclerosis. Kidney Int 2014;85(1):124-33. I wish to thank the authors of the review (1) of my book on scientific writing (2). Here are further free documents for authors: the Micro-Article, described in the book, is a template allowing to identify the main discovery before starting to write an article (3). Writing a Review Article in 7 Steps is a short note providing guidelines to write a review or a book chapter (4). This note proposes in particular a convenient method to build the abstract by writing first short conclusions at the end of the manuscript sections. The golden rules of scientific publishing are outlined in a brief presentation (5). Scientific Writing and Communication is the presentation of my workshop given to Masters, PhDs and research scientists (6). I am the author of the book reviewed.